Moto3 got Sunday’s race action under way with a restarted race after Jasper Iwema’s massive crash . After also leading the first race Estrella Galicia rider Alex Rins won the five lap sprint after the restart at the Circuit of the Americas in Austin,Texas. Intially Luis Salom made the best of the situation after fading in the original running, the stop giving him the opportunity to change the tyres on his Red Bull KTM Ajo, which appeared to solve his woes. Salom went wide racing into the final corner which also allowed Team Calvo’s Maverick Vinales through for second. on the rostrum as Qatar. They also dominate the championship standings due to their consistency with Salom and Rins tied on 41 points, one ahead of Vinales. 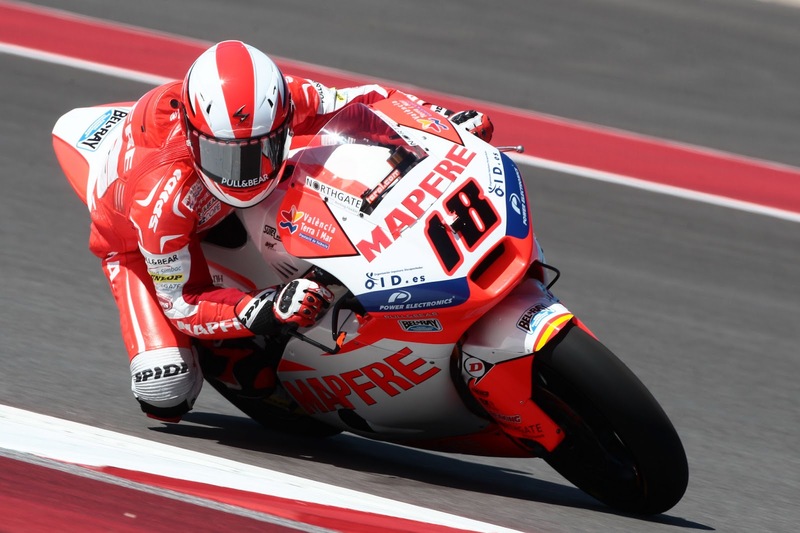 Jonas Folger tried to keep pace with the frontrunners again but ended up fourth for Mapfre Aspar, while Miguel Olivera recovered from a lacklustre qualifying to be the highest non-KTM finisher in fifth spot for Mahindra. Jack Miller was the top Honda rider in Sixth for Caretta Technology. British rider Danny Webb battled to eleventh for the Ambrogio Racing team with his countryman John McPhee doing his best after his Caretta bike was ruined in his Qatar crash coming home 21st, one place behind female rider Ana Carrasco in a credible 20th for Team Calvo. Moto2 had a lot of drama to follow and brought plenty of action of it’s own when title favourite Pol Espargaro crashed out early in the race. The Tuenti HP 40 rider had qualified his Pons machine down in seventh and pushed too hard while trying to move up the order. Nico Terol raced hard from the start and found himself with a gap of over three seconds pretty quickly, which he maintained on his Mapre Aspar Suter machine until the chequered flag for his debut Moto2 win. He had a previously strong record when the support classes have travelled to America before, with three Indianapolis 125cc wins to his names. His fourth grand prix win in the states brings him tied for the most wins on American soil with Casey Stoner. The battle for second was fierce with Pons Tuenti’s Tito Rabat working his way up the field to second after tussling with Marc VDS rider Mika Kallio who finished in the final podium spot and Technomag carXpert’s Dominique Aegerter, who missed out on the podium after contact with Kallio. Scott Redding lead the early laps but couldn’t keep pace due to what appeared to be a problem with tyre wear, his fifth place is enough for him to lead the championship standings after the opening two rounds. Italtrans rider Takaaki Nakagami seemed to suffer similar issues as well as a gearbox problem and retired from the race. Danny Kent (Tech3) and Kyle Smith (Blusens Avintia) both showed big improvements over the weekend in their rookie seasons and after strong qualifying performances finished 18th and 21st respectively. Moto3 and Moto2 return in Jerez on the weekend of the 3-5 May.